In store demonstrations, product sampling, brand experience, and trade fairs are extremely successful ways of getting a brand and product in the public eye. Encouraging your target audience to touch, smell and play with your product really promotes a sale. Link this with experienced and motivated promotional staff from Pitlane Staffing Agency and you have a formidable platform for boosting your sales. 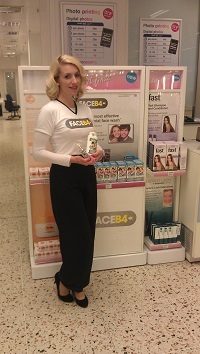 The success and power in promoting a product through in store demonstrators became very popular in the early eighties. Retail owners wanted the power to bring their products out from behind cabinets and display shelves and put them firmly in the face of buying customers. The art of in store demonstrations has become very popular with large retail outlets such as supermarkets, department or discount stores and shopping centres. Independent retail outlets have also found it an extremely successful sales tool and promotional demonstrators can be found at many trade shows and trade fairs. Pitlane Promotion has large team’s of experienced male and female demonstrators across the UK that ensure that your product gets into your target markets hands and leave a lasting impression. We can provide one person or teams of any number to anywhere in England, Scotland or Wales. We hand pick not only in store demonstrators that are attractive and motivated but that have completed in store demonstration assignments in the past. This way you can be comfortable and confident that your product will get the exposure you want coupled with increased sales and revenue. This form of marketing gives you a fantastic opportunity to engage with your consumers directly and ensure the features, benefits and workability of your product are demonstrated and explained in full. With a successfully run demonstration event you can improve your brand awareness, promote a new line of goods and services, run alongside any other marketing campaigns and use as a way of up selling other products. Pitlane Promotion has In store demonstrators, Lead Generators, Street canvassers, survey staff and market researchers throughout England, Wales and Scotland so your geographical location has no bearing on the experienced, quality staff waiting to make your next demonstration campaign a huge success. Our promotions team will be delighted to talk through with you how we can assist with your next campaign so please call us on 0844 800 0071 for a free and fast quotation or if you prefer complete the enquiry form below.